As the holidays approach and manufacturing peak season has started in sourcing powerhouses throughout Asia, QIMA data on inspection and audit demand reflects the overall trends in the region. YTD data on inspection volumes in China suggests strong annual growth at +11.6%, as the sourcing powerhouse is set to exceed its revised 2017 growth forecast of 6.7%.i Southeast Asia is showing robust growth as well, with inspection and audit volumes rising by +22.7% YoY in Cambodia, while Taiwan and Thailand show continuous expansion throughout 2017. 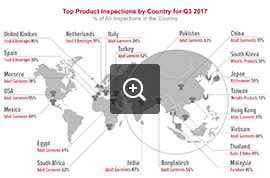 In South Asia, Pakistan’s inspection volumes rose +18.7% YoY in Q3 2017, continuing the growth trend observed by QIMA last quarter. Multiple production regions outside of Asia are showing sustainable growth. As some brands diversify their geographical sourcing patterns, in Latin America, demand for inspections and audits has increased by +65% YTD. Meanwhile, African manufacturers continue strengthening their foothold in the global textiles market, with textile and apparel inspection volumes rising +7.1% and +13.6% YTD in South Africa and Lesotho, respectively. The peak season's tighter shipping deadlines are definitely putting a strain on ethical compliance. Third-quarter data from QIMA factory audits shows the percentage of fully-compliant (“Green”) factories dropping to 30% across the board (compared to the 2016 average of 34%), while the share of factories with critical non-compliances increased by almost a third, to 34.7% from the 2016 figure of 27.3%. Corrective action in the medium term is necessary in the remaining 35.3% factories, which received an “Amber” score. QIMA data shows that of all the major ethical issues, manufacturers are still struggling with working hours and wages compliance the most, achieving average scores of 6.4 out of 10 in this category (compared to 7.3/10 at the end of 2016). After a slip in ethical performance earlier this year, factories in China seemed to stabilize their social compliance during this quarter, with average scores hovering around 7.5/10. Meanwhile, suppliers in South and Southeast Asia remain on an upward trend, scoring on average 7% higher compared to 2016. A look at ethical scores by industry shows that the Homeware and E&E sectors performed best, scoring 8.1 and 8.0 out of 10 respectively, several percentage points above the cross-industry average score of 7.7. Ethical compliance in the toy industry, in the meantime, has been significantly poorer during 2017 compared to the previous year (7.4/10 in 2017 vs. 8.1 in 2016). Textile and apparel factories saw a slight decline in ethical scores in Q3, and still fall behind the average, with 7.6/10 in 2017 (vs. 7.8 in 2016). Meanwhile, structural safety has further deteriorated during Q3 2017, as seen from QIMA field data. While the share of compliant factories remained virtually unchanged compared to the end of 2016, at around 32%, the ratio of factories in need of immediate remediation has more than doubled (6.7% in 2017 YTD vs. 2.5 at the end of 2016). Medium-term risks were found in the remaining 61.3% of factories, where remediation is still incomplete. Manufacturing quality in factory shows some improvement compared to last year’s figures: the overall percentage of products outside of acceptable quality limits in Q3 2017 was 4 points lower YoY compared to 2016. Individual countries and regions overall maintain their previous quality performance trends. For example, China’s manufacturing quality improved slightly, with 19.7% of products falling outside of acceptable quality limits in Q3 2017 (vs. 22.2% in Q3 2016). Manufacturing quality in South Asia remained traditionally poor, as between one-quarter and half of products failed in-factory inspections in India, Bangladesh, and Pakistan. Product quality by industry continues to reflect the degree of automation and technology in each respective sector. 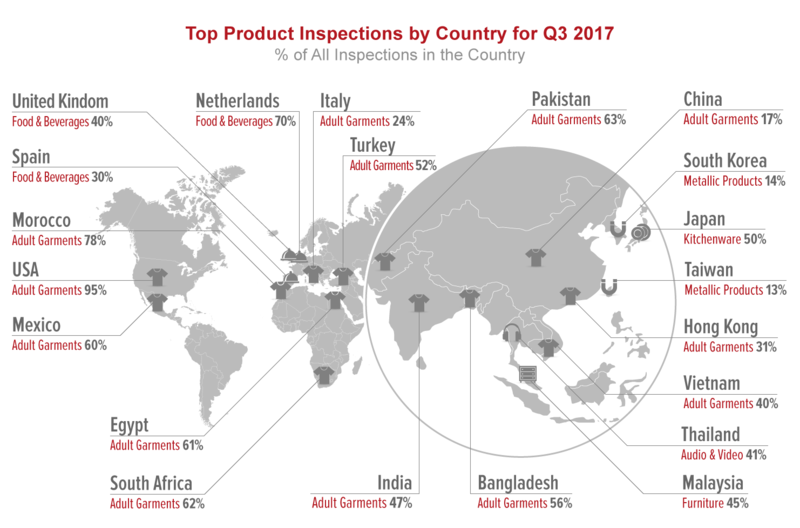 The Textiles and Apparel industry, which still heavily relies on manual, often low-skilled labor, performed the worst, with around 30% of onsite inspections finding more defects than allowed during Q3 2017. By comparison, during the same period, only 16.9% of products came short of specifications in the more technologically sophisticated E&E sector. By contrast to the improvement in factory, product compliance in lab took a hit during Q3 2017. Having tested thousands of consumer products, QIMA labs found that up to 12% of lots intended for the US market contained excessive amounts of lead, cadmium and other heavy metals (compared to 8% in 1H 2017), while 11% contained banned phthalates (vs. 8.7% in 1H 2017). Products intended for the EU performed better in lab, with 2% and 5% of products failing to meet REACH requirements for lead and phthalates, approximately halving the failure rates compared to 1H 2017. Product compliance in the toy industry remains a challenge, as manufacturers targeting the US market struggle to comply with the recently updated key US standard ASTM F963. Tests in QIMA labs of toys and children’s products covered by this standard showed that 8% of toys did not meet the requirements on flame retardancy, 9% failed due to mechanical hazards, and up to 10% contained unacceptable amounts of heavy metals. Eyewear is another product category that struggles with compliance; optical, chemical and performance tests in QIMA's HOKLAS accredited lab showed that as many as 12% of eyewear intended for the EU market and 28% of those for the US market failed on a number of specifications, including nickel release. Among the multiple product types in this category, ready-to-wear spectacles proved the most vulnerable to compliance failures, with sunglasses not far behind.